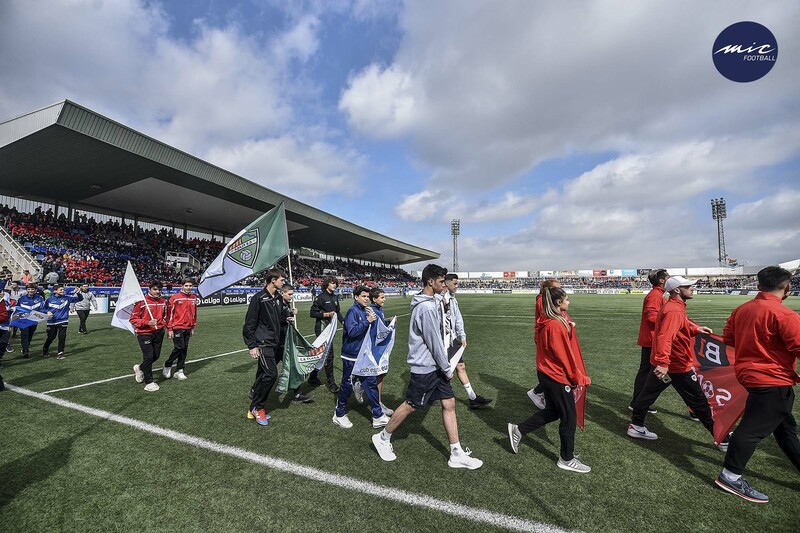 Almost 7,000 spectators attended this Wednesday morning in Figueres (Girona) at the opening of the 19th edition of the MIC International Mediterranean Football Cup tournament, which will last until Sunday, 21st of April in Costa Brava. The Municipal Stadium of Vilatenim has received, for the second consecutive year, the staging of a tournament that has been premiered with the U19 category match between Real Madrid CF and Kaptiva Sports FC. The whites, trained by the ex-player Raúl González and already champions of their league, have imposed the difference of category against the team of Barcelona (5-0). The inauguration counted with a parade with flags of all the participating teams accompanied with a rythim of “batucada” and a great dance in the field with more than 400 participants from the urban dance school Dance Me. Just before the start of the inauguration match, the institutional parliaments have been held by David Bellver, MICFootball president. He remarked the importance of “the institutions, sponsors, collaborators and most important, the teams which come from more than 40 different countries from around the world that continue to come year by year”. In the same line, Pere Vila, from Generalitat de Catalunya in Girona Government delegate, has emphasized “every club and every local government make MIC possible, a tournament anybody wants to lose and that is a global reference”. Miquel Noguer, Diputació de Girona’s president, has recognized the fact that “it is an honor that MIC, the best youth football tournament, is held in our homeland” and has welcomed in all the assistants here in Costa Brava. 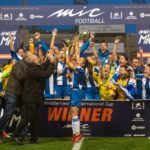 Jordi Masquef, Figueres mayor, has declared MIC as the “most important youth football tournament in the world” and it helps “accentuate the importance of the effort made and the overcoming spirit in sport and in life itself”. Prior to the inaugural events, the U12 category team of the Manchester United FC has won against the UE Figueres (0-5). Halfway to the game Real Madrid CF-Kaptiva Sports FC, the 8th edition of the Dani Montesinos Award for sports journalism has been awarded, which recognizes the young talents of the profession and aims to remember the figure of the journalist who died in 2012 in a traffic accident. Marc Abelló, a student of the degree in Journalism at the Autonomous University of Barcelona, has been proclaimed winner of the work titled De niño a futbolista, a report that deals with the sacrifice of young people who want to live from football. Abelló will be rewarded with some practices in GOL television channel. The family of Dani Montesinos have been present at the event next to Juanjo Rovira, director of MICFootball. The MICFootball’19 has begun with a total of 35 headquarters, from La Jonquera to Hostalric, and the news of this year are Peralada and Vilablareix. The split of the U19, the inclusion of the assistant video assistant (VAR) and the increase in television broadcasts, will mark a MICFootball that will celebrate its 20th anniversary this year. The figures for this edition will be similar to those of 2018, with the forecast of having 900 matches, 6,550 players and 364 teams from 43 countries of the 5 continents. The tournament has expanded the range of participating countries with the entrance of Uruguay, Zambia, Kenya, Malta and Uzbekistan. To promote the competitiveness of the teams and continue the dynamics of previous years, categories have been split up and this time the U19 has been divided into players of first and second year, on the one hand, and third year on the other -This fact already happened in U16 and U14. In total, there are nine categories, from U12 to U19 in male and female soccer -11, and U12 male soccer-7. The finals will be disputed between Saturday and Sunday in Palamós and Figueres. The split of the second year of the U19 category in the 19th MIC – Mediterranean International Cup is linked to one of the other great new features of the tournament this year, the VAR. The video assistant referee is being implemented in U19 category matches played in Lloret de Mar and will serve as a test bench in the formation of the referees of LaLiga 1 | 2 | 3. The video arbitration will be implemented in the second division A 2019/20 and during the MICFootball it will be practiced by the 22 main referees and the 44 participants in the silver category. Television broadcasts are also increasing through GOL, Movistar+, LaLigaSportstv, Esport3 and Costa Brava TV and a large part of the tournament can be followed from any corner of the world, by streaming, through the web www.micfootball.com . The tournament, during the five days of competition will see teams such as FC Barcelona, Real Madrid CF, Atlético de Madrid, RCD Espanyol, Manchester City FC, Manchester United FC, Tottenham Hotspur FC, Liverpool FC, Paris Saint-Germain FC, FC Internazionale Milano, Parma Calcio, Olympique de Marseille, FC Porto and FC Shakhtar Donetsk. Top-level football teams and players currently in the world elite have been in previous editions of MICFootball, such as Leo Messi, Philippe Coutinho, Gerard Piqué, Sergi Busquets, Sergi Roberto and Jordi Alba (FC Barcelona) , Neymar Jr. (Paris Saint-Germain FC), Dani Carvajal, Carlos Casemiro and Sergio Reguilón (Real Madrid CF), Marcus Rashford and Juan Mata (Manchester United), Justin Kluivert (AS Roma), Alex Iwobi (Arsenal FC), Cesc Fàbregas (AS Monaco), Saúl Ñíguez (Athletic Club of Madrid), Marc Bartra (Real Betis Balompié) and Pablo Fornals (Villarreal CF), among others. The MICIntegra tournament, focused on people with intellectual disabilities, celebrates 7 years. Several football teams and basketball throughout Catalonia will be cited this Friday, 19 (from 9.30 a.m. to 7 p.m.) in Vidreres to compete among them. The MIC Integra, which will have 21 football teams and four basketball teams, is supported by “la Caixa” Welfare Projects and the Damm Foundation and aims to promote the creation of a space in the sports imaginary to make these players have their own competition. The MICBasketball, established in 2017, will start its third edition this Thursday 18th of April and will also be extended until Sunday 21st. There will be about 700 players and some of them coming from the quarries of the ACB league and internationally, such as FC Barcelona, Valencia Basket, Zalgiris Kaunas (Lithuania), Thirty (Russia), New York Gauchos (United States), Brainers Basketball Academy (Lebanon), Los Leones de Quilpué (Chile) and Chisz (Zimbabwe), among others. The more than 130 games will be played in ten sports centers of eight towns in the province: Lloret de Mar, Sils, Vidreres, Caldes de Malavella, Cassà de la Selva, Maçanet de la Selva, Santa Cristina d’Aro and Girona. The finals will be played between Saturday and Sunday in the Pavilion of Palau, in Girona. 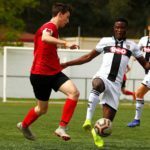 During the previous two editions, players such as Dusan Tanaskovic, from KK Partizan, have already taken part in the EuroCup, or the Badalona youth squad, champion of the prestigious Júnior Tournament of l’Hospitalet. The MICFootball, which again counts with the Diputació de Girona, CaixaBank and LaLiga as the main partners, moves along with the MICBasketball more than 10,000 people between players, trainers, volunteers, parents and referees. According to the MIC Economic Impact Study – Mediterranean International Cup 2018 commissioned by the Costa Brava Girona Tourist Board, the MIC 2018 generated a return in the territory of more than 11.5 million euros. For each euro invested by the public administration there was a return to the territory of more than 100 euros (125 euros for football and 100 euros for basketball). In addition, it is found that the MICSports tournaments improves the positioning of the Costa Brava as a destination of Sports Tourism and makes a international projection of it. In February, the Diputació de Girona and MICSports signed a declaration of intentions to ensure that the MIC – Mediterranean International Cup football and base basketball tournaments continue to be celebrated in the Girona region for another four years, until 2023.